Did I not in private talks and public lectures [in the USA before WW I], warn against the German danger? Ronald Florence's account, Lawrence and Aaronsohn (New York: Viking 2007), agrees with Katz's account of Aaronsohn's attitude towards the Germans and German collaboration with the Ottoman state in the genocide. Katz is well known for his excellent, extensive biography of Ze'ev Jabotinsky. However, before writing about stirring events Katz was active in the Jewish nationalist Zionist movement led by Jabotinsky up until 1940, when he died, and later by Menahem Begin. Katz was part of the high command of the Irgun Tsva'i Le'umi, National Military Organization, an underground body that fought the British and drove them out of Israel, at least out of that part of the Land of Israel that became the State of Israel in the 1947-1949 War of Independence. It is not clear why those two passages were omitted from the distributed version of Aaronsohn's report by British officials. But Aaronsohn clearly feared the extension of the Armenian genocide to the Jews. The expulsion of 9,000 Jews from homes in Jaffa and Tel Aviv in 1917 only confirmed this fear. Both Katz' and Florence's books make clear that the Jews in the Land of Israel at the time lived in fear. It was a fear shared by Eitan Belkind, whose eyewitness account of the genocide we have been quoting in instalments on Emet m'Tsiyon. This fear was the prime reason for formation of the NILI underground. We now go on to the last instalment of passages from Belkind's book about the Armenian genocide. This passage shows how Belkind too saw the German attitude towards the genocide. In Deir ez-Zor, I stayed with the pharmacist Arto, who now had five Armenian wives whom he married so as to save their lives. He told me that about 30 Armenian women were working in the military hospital. This had been Doctor Bekhor's way of rescuing them. I must mention that all the time I was in Aram-Naharayim, I was unable to eat the splendid fish from the Euphrates, which I liked very much, remembering that those fish had fed off the corpses of murdered Armenians, including young children. . . . While still in Damascus. . . I gave my records about the Armenian massacres to Yosef Lishansky. When we returned [to the agricultural] testing station [in Atlit, Israel, near Zikhron Ya`aqov], I stayed with Sarah [Aaronsohn, sister of Aaron]. She told me that my records of Armenian massacres, which she had sent to Egypt [to the British], had made a great impression. In my trips in the south of Syria and Iraq I saw with my own eyes the extermination of the Armenian nation. I watched the atrocious murders and saw children's heads cut off and watched the burning of innocent people whose only wrongdoing was to be Armenian. . . .
On the advice of the Germans, the Turks perpetrated brutal massacres of the Armenians by the hands of the Circassian Muslim fanatics. Aaronsohn seems to have been prophetic about the coming Holocaust in his remarks about the Germans. Coming: More on Obama the war candidate -- his mask drops with a loud bang, More on the anti-Jewish racism of the "Peace Process," Jews in Jerusalem, Hebron, the Land of Israel, archeological updates, peace follies, propaganda, etc. The roads were strewn with the corpses of murdered Armenians. That's how the previous instalment of Eitan Belkind's account of the Armenian genocide [part 2] ended. Belkind traveled north on the road to Urfa and "witnessed several mass exterminations of the Armenians." [Urfa was the Biblical Ur of the Chaldees, now in southeastern Turkey. Nowadays, the Biblical Ur Kasdim, אור כסדים Ur of the Chaldees, is usually mistakenly identified with the Ur in southern Mesopotamia dug up by Woolley. In fact, several ancient cities in the region have Ur as part of their name]. In another passage, Belkind describes Jews caught up in the Armenian genocide.
. . . I went to the sheikh's tent and was very happy to find my friend Jacob Baker. . . I told him [speaking French for security] about these things that happened to me in Urfa and about Armenian pogroms that I saw on my way and he told me about his work in Mosul. We sat talking late in the night, when suddenly the child whom we mistook for a Bedouin told us in French that he and his mother are Armenians and the chief of the tribe had saved them from extermination. His mother became the sheikh's wife and he helped welcoming guests. The child went on and told us that the chief of the other tribe had a Jewish wife taken from a family of the city of Caesarea in Anatolia. Her husband had been killed and the sheikh took her. We were shocked upon hearing this and asked the boy whether we could meet the woman. In spite of the danger, the child got into the tent where the Jewess was. Everyone in the tent was asleep and the woman managed to get out unnoticed. She was 25 and very beautiful. She told us her surname was Biram, a typical Turkish name. Her family lived in the Armenian quarter of the city and when they were taking the Armenians, they also took this woman with her husband and child despite all their protests. Her husband and child had been killed but she was rescued by the Arab sheikh who took her as his wife. We promised to take care of her. [grammatical and spelling corrections made by Eliyahu to the translated quotes from Eitan Belkind's book, That's How It Was, the Story of a Member of Nili (Tel Aviv: 1977; in Hebrew; translation by the Armenian Genocide Museum-Institute). As we have commented before, what Belkind is describing is genocide. Here he shows that Jews too were caught up in the Armenian genocide. It was apparently convenient to take this family since they lived in the Armenian quarter of their town. Their protests did them no good. The Jewish and Armenian women were grateful to be saved even at the cost of becoming an Arab sheik's subservient wives. The next instalment will indicate how Imperial Germany felt about the mass murder of their fellow Christians. Aaron Aaronsohn also mentions the German attitude and participation in the genocide, as quoted by Ronald Florence in Lawrence and Aaronsohn. Can we have less silly chatter from academics that there was no Armenian genocide?? Coming: more on Jews caught up in the Armenian genocide, peace follies, propaganda, Jews in Jerusalem, Hebron, etc., How Israel should have handled the hostage-takings, etc. The "new" anti-Zionism is not fundamentally different from the "old" antisemitism/Judeophobia. This is particularly true in the themes and claims made by today's and yesteryear's Judeophobes. Then, before World War One, the Jews were held as not being true Europeans, which meant true French, German, Anglo-Saxon, Nordic, Polish, Russian, Rumanian, etc. Rather, 100 years ago, Jews were explicitly viewed as Orientals. Now --presto changeo, hocus pocus-- Jews are held as not being true Middle Easterners, not being "authentic" inhabitants of "palestine" [a geographic notion alien to the Arabs, by the way]. The Euro-Judeophobe around 1900, perhaps someone like George DuMaurier, author of the Judeophobic novel Trilby [the villain is a swarthy Polish Jew], at least had his history right. The Jews in Europe [albeit not a pure race] did not originate in Europe but were on the whole descended from migrants, refugees, slaves captured in the Roman-Jewish wars, etc., although they had been in Europe since Roman times whereas Jewish migration to Europe from Israel and elsewhere in the Middle East continued through the Middle Ages [Cecil Roth, Simon Schwarzfuchs]. Maybe the migrants in the Middle Ages were getting away from the Arabs. Another Judeophobic novelist was the immensely popular John Buchan and his 39 Steps concealing a Jewish conspiracy. Buchan was later rewarded by nomination as governor-general of Canada. In Thackeray's Vanity Fair, one of the characters least loved by the author is a girl from the West Indies, half Jewish and half Black. DuMaurier was also an illustrator for the British weekly Punch. 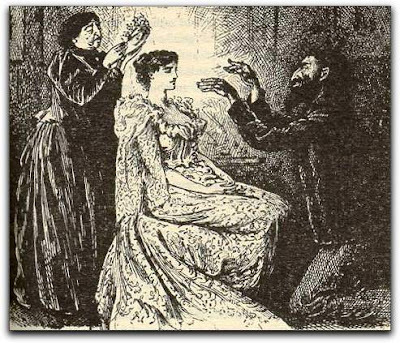 This is his own depiction of what Svengali, his Jewish villain, and Trilby, the pure white maiden, looked like to DuMaurier himself. Note the contrast betweenTrilby's pale whiteness and Svengali's darkness, which is further intensified by his placement in the shadows. Curiously, many Judeophobic cartoons in the Arab press show Jews looking much like Svengali. [See A. Stav, Peace, The Arabian Caricature, 2000][picture source: Mystic Bourgeoisie] Can today's anti-Zionists deduce from this picture that Jews were considered "Europeans" just like everybody else? Today's Judeophobes in their "anti-Zionist" guise get even their history wrong, sometimes claiming --in so many words-- that the Israelis are really true Europeans, the truest of Europeans --thus, the whitest of the white, the most Nordic of the Nordics, as it were-- and the most guilty, therefore, of colonialism, imperialism, racism, apartheid, etc. Here, the geographically alien nature of the Jew has been transposed from Europe to the Middle East, while --in addition-- specifically European/Western sins have been unloaded from the Europeans and laden onto the Jews. These claims are probably made more often by insinuation than by direct assertion. Yet, they are commonly expressed in the most politically correct Euro company. Today, as then, highly prestigious spirits in the UK, Germany, Portugal, Norway, etc., Nobel-prize winning novelists and the like, suspect a Jewish conspiracy behind whatever displeases them throughout the world, and they compulsively identify Israel with the Nazis. This is in order to recover their sense of moral superiority to the Jews, temporarily tarnished by knowledge of the Holocaust. Before and during the Vichy regime in France, pacifists and socialists, as well as Rightists of the Maurras stripe, wanted peace with Hitler, with the Nazis, and then collaborated in the Vichy regime and persecution of Jews. On this see, inter alia, a recent book by Simon Epstein, Un Paradoxe français. As far back as the 19th century, the German socialist August Bebel, described antisemitism as "the socialism of fools." Today, anti-Zionism is the anti-imperialism of fools, albeit a Nobel prize winner is not so foolish as to be unable to count the prize money awarded to him. To conclude, would it be unfair to the Arabs to mention the plentiful evidence from DNA studies of Jews, Sefardim, Ashkenazim, Mizrahim [Oriental Jews] and comparisons with other Middle Eastern and Mediterranean peoples?? Brian Cheyette,"Neither Black nor White: The Figure of 'the Jew' in Imperial British Literature," in L Nochlin & T Garb, eds., The Jew in the Text (London 1995); also see writings here by Linda Nochlin, Tamar Garb, Kathleen Adler, etc. Montagu Frank Modder, The Jew in the Literature of England (Philadelphia: JPS 1939, 1960), pp 300-301.